True enough, Ghent is a cosy little city that is fascinatingly complementing its rich historic beauty with young and cosmopolitan vibe. It is considerably one of the richest and most powerful cities in Europe during the middle ages. Such rich past can be clearly seen on its canal-side architecture that has been restored and continuously well-taken cared of. Ghent is also a university city. You can find an interesting mix of young people who are mostly students, and foreigners who also came to live here. Are you now interested to visit Ghent? If ever you are, let me share with you the top things I did that I’m pretty sure you’ll also enjoy. Like its sister town Brugge in Belgium, visiting the city of Ghent is like coming into a feast of architectural masterpieces brought back to life. It is as if the time stood still, as you mesmerize on the castles, cathedrals, churches, bridges, cobblestones and old merchant houses, only then you’ll be reminded of the present when you catch modern structures in between. Ghent Market Hall is a perfect example. Built in 2013, the building positions itself in between St. Nicholas Church, St. Bavos Cathedral, the belfry and the town hall where locals can meet and attend events. The square is used to be a parking lot for decades, thus the structure is meant to give the site more meaning. The architectural design may appear very modern, yet it has masterfully and respectfully integrated the historical context of the city. Later I found out that the new market hall did stir controversy amongst conservative locals, protesting creatively by drawing out expressions like Ghent bleit (Ghent cries) and Ghent rouwt (Ghent mourns); and silly monickers they’d call the building as Schandhal (Hall of Scandal or Shame) or Schaapstal (Sheep shed). Anyhow, it is indeed polarizing from the looks of it, but for me, after having loads of medieval sightseeing, I find it refreshing to find something different and new. Amongst the must-sees while exploring the streets of Ghent are: Belfort en Lakenhalle (Belfry and Cloth Hall), Korenlei, Graslei, Patershol, St. Michael’s Bridge, Beguinages, Vooruit, Sint-Niklaaskerk (St. Nicolas Church), Sint-Baafskathedraal (St. Bavos Cathedral), Het Gravensteen (Castle of the Counts). Graslei and Korenlei are actually the two streets in the medieval port with the long river in the middle that showcase a unique sight of historical buildings in Ghent. In Graslei you’ll find the guild halls – the house of the grain weighers, the guildhall of free boatmen, the spijker…with each has a story of the glorious medieval past to tell! At the other side is Korenlei, where only the facade of the original buildings is all that’s left and behind it are the new hotel (Marriot) and a few pubs and restaurants. From Graslei and Korenlei, you can also start seeing Ghent in a different view by taking on a boat tour along the city canals. The tour lasts for almost an hour and it costs 7€ for adults; 6.50€ for seniors and students; 4.00€ for children aged 3 to 12; free for children under 3. Gravensteen means castle of the counts, which was indeed built by the count Philip of Alsace and eventually served as a seat of the Counts of Flanders until the 14th century. Over the next centuries, Gravensteen gradually lost its function and had become outdated and unsafe. The castle slated to be demolished when the city of Ghent began buying back the castle in 1885 to start its restoration. Today, Gravensteen Castle becomes the city’s most important tourist destination. Many cultural activities, events and parties have also been held since then. Quick tip? Take the stairs up to the top of the castle so you can have a full view of the city. 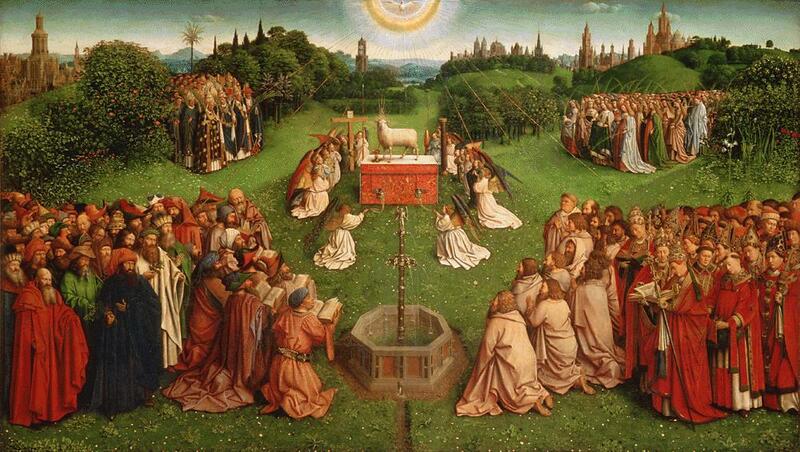 The Adoration of the Mystic Lamb is the Ghent altarpiece painted by Hubert and Jan van Eyck that has been considered one of European art’s masterpieces and one of the world’s treasure. It was the first major oil painting in the world with Catholic mysticism all throughout. Possibly due to its sheer reputation, it is considerably the most stolen artwork of all time, that up to now, a part of the painting has been missing for 80 years. You can have an up-close and personal look at this altarpiece at St. Bavo’s Cathedral. Two-thirds are definitely original works and you can see the missing pieces replaced by its black-and-white replicas. It goes with an audio guide that vividly tells the details and stories behind this important artwork. Ghent is an interesting town to explore its food delights you’ve never been seen or heard of, alongside with visiting its equally unique food shops. There’s the sweet cuberdons, their crème de la creme pralines, Larmuseau snowballs, kroakemandels (crunchy salted peas), mastel bread, a traditional soup waterzooi, Ghent’s Ganda ham, an elderflower-flavored drink RoomeR, Gruut beer, Tierenteyn sought-after mustard, amongst many others. Patershol is a narrow cobblestone street area in the heart of Ghent, beaming with quaint and charming little shops and restaurants. Get yourself swooned by its character as you stroll around to see old buildings in unique Belgian architecture. Or get cosy in a nice coffee bar in late afternoon or for a dinner in a restaurant of your choice. Am I getting sound too cheesy now or what? There are lots of music festivals in Belgium, believe me. And Ghent of course, has its very own – the Ghent Jazz Festival and Ghentse Feesten. The Ghent Jazz Festival is an international jazz festival held every year in July. Renowned jazz artists from Belgium and abroad perform in a two-week programme. Ghentse Feesten is a music and theatre festival that usually starts on the Friday before July 21 (Belgium’s national day). It lasts 10 days until the last day (usually a Sunday) they dub it as de dag van lege portemonnees (the day of the empty wallets) – how silly is that! Well, Gentse Feesten is very popular as about 2 million vistors attend the festival every year, making it one of the biggest festivals in Europe. It will be interesting to walk around Ghent by nightfall as the city came up with the Light Plan that is designed to emphasize prominent monuments, buildings, entrance gates, traffic intersections, commercial streets, parks and squares. You can follow this map here; it guides you through on the particular streets and alleys for some sightseeing by night. Unfortunately, I missed this year’s Ghent Light Festival as it only happens every three years and at that time, we got busy with our move to Belgium. It is one of the most dazzling light art shows in Europe and definitely the biggest cultural events in Ghent. Have you also been to Ghent before? How was it? Or do you like to visit Ghent soon? What are the things you will definitely do in this charming city?